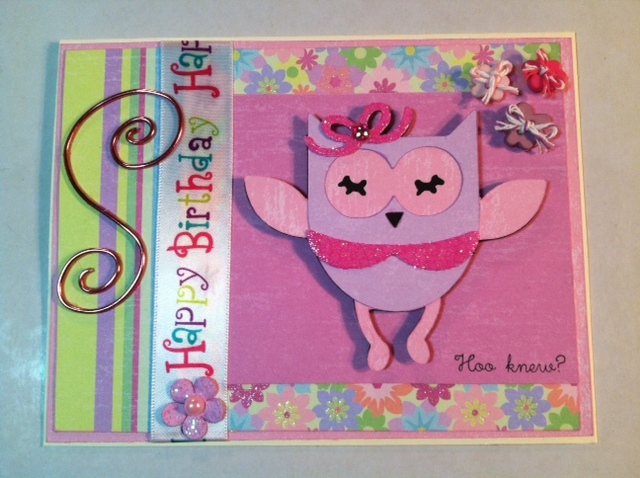 Craftin Desert Divas Blog: Hoo knew? I'm always short on birthday cards so I have been making quite a few lately to build up my stash. This is my first time using the Twinkle Toes cartridge. I'm trying to challenge myself on using all the new cartridges that I have not used yet. There is a lot of cute images on this cartridge. I thought this ballerina owl was just adorable. I made the pink wire from Purple Cow Craft Geek Wind It. I bought it while on I was on vacation a couple of months ago, and this is the first time I have used it. I really do like it!! It comes with several templates and you just wind the wire around it and snip it. It's as simple as that. I also found you could buy the colored wire at local craft stores. Super cute! Twinkle Toes has the sweetest images and great labels! Love the wire! This is so cute, great image and I love your colour choice. What a super cute and fun card!! Love the bright colors and the ribbon you used !! Thanks for joining us at DCD this week! Adorable. Love the colors and the little Owl. Would love to have you visit some time. Just signed up as your newest follower! 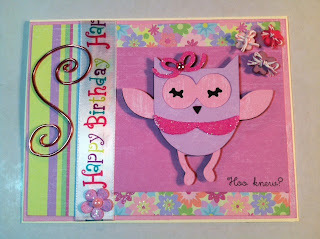 What a very Cute card!Adorable Owl! This is absolutely adorable!! I love the sweet owl and the beautiful design!! What a fabulous card!! The ballerina owl IS really adorable! Cute card, Tara. Thanks for sharing at Die Cuttin' Divas this week. so sweet, love the colors!! I'm a new follower from Erica's SVG Sunday's blog link up!